LG launched most awaited GC 900 camera phone in Indian market . 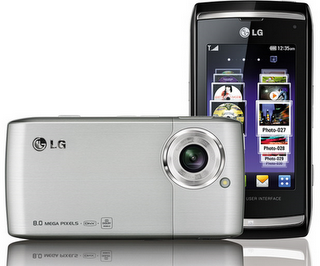 LG GC 900 is the successor of LG Viewty series of phones . But the difference is that it includes an 8 mega pixel auto focus camera with LED flash . LG GC 900 will compete with existing camera phones like ,SonyEricsson W995 ,Samsung Pixon8 ,Sony Ericsson C905 and Nokia N86 . The phone is equipped with the new generation S class user interface designed by LG . Other LG GC 900 specifications includes an 1.5+8GB free card further expandable upto 32 GB, 3G ,WiFi ,TV out and 3 inch capacitive touch screen with accelerometer sensor .The price of the phone India is around 28000 including taxes . LG GC 900 ‘s 8 mega pixel autofocus camera with Schneider-Kreuznach optics and LED flash is capable of producing average quality images to a maximum of 3264×2448 pixels and videos at 30fps (3GP only). Shots are not good as taken with W995 and N86 . Geotagging, image stabilization, multi face detection ,and smile detection are few other features with GC 900 camera system .Exterior parts are built with plastic . The phone is extremely thin than it appear in the photos . Capable is playing DivX/Xvid videos . Software support for Microsoft office documents . As we said earlier the price LG GC 900 phone in India is 28000/- including taxes . We felt this little over priced considering the build quality ,software support and the quality of the images taken . I have a query about this phone. In my LG GC900F, whenever am getting an incoming call, the backlight is getting switched off and am unable to locate the “call attend place” on fone and the calling person’s name. How to resolve this issue? I checked call and phone settings but could not find any option. Yes Yogesh, even though am keeping the phone on table and try calling, the display light is off. I doubt if any software installation issue. There could be such?